The Active Atom speakers are designed to suit multiple purposes and work in tandem or solo. Paradigm Shift is a bit of a presumptuous name, but their new Active Atom speakers are fairly impressive for what they are. The A2, as Paradigm Shift calls it, is a bi-amped speaker that offers 100 watts of power per speaker. It has a pretty decent frequency response for a smaller speaker - 55Hz on up to 20kHz. You'll find a 5-1/2 inch aluminum cone woofer and a 1 inch aluminum dome tweeter. In addition to doing the thing that a speaker is supposed to do - reproduce audio - the A2 packs Apple AirPlay for wireless streaming from your computer or Apple mobile device. You'll need an AirPort Express to make it happen though. 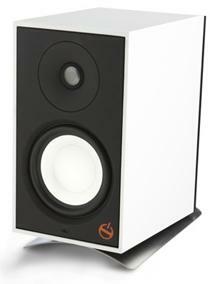 The Active Atom speakers from Paradigm Shift will be available in the winter of 2011 for a price of $279 each.